As a new mum of two my sleep is something I treasure... and it's something I am currently lacking! You expect the sleepless nights, but that old saying "sleep when baby sleeps" is in possible to do when you have another little person to look after too. I love being a mum of two and wouldn't change it for anything, but for Christmas I could do with some sleep! Ensuring us mum's get enough sleep is the key to a happy home, I don't know about you but I'm certainly not at my best when I have only had four hours of disturbed sleep! So for a happier home a great night sleep for everyone is a must and something I have been trying to implement in ours. Creating a calming space for you is a good place to start, after a long day with the kids and/or at work your bedroom should be a room of relaxation and a place where you can re-charge. De-clutter the room, keep it minimal and use calming colours. Our room can become a bit of a dumping ground on a hectic day, but I always try to have a quick tidy in there before bedtime to ensure I'm not going to bed thinking about all the mess and things that need tidying! Kids need a comforting and relaxing space too. For a while Darcie struggled with her mattress until we caved and decided to do some research and get her a better suited mattress to get her into deeper sleep. Sealy has made it their mission to ensure their customers get that deeper sleep we're all after and have been given the seal of approval by winning awards from Which? Best Buy - who even claimed Sealy's Teramo 1400 was the "best mattress tested in years". Lots of children can struggle with the dark, so perhaps having a little night light may help them feel relaxed in their own space. Devises such as the Gro Clock can also help with bedtimes, it certainly helps when I'm trying to put Darcie and Henry to bed at the same time - she know's whens it's bedtime now and never argues or tries to stay up longer than she should. That's one less thing to worry about! For babies it is, of course, the most challenging aspect of getting sleep. They need feeding & changing throughout and though this is only temporary (I promise!! ), at 2am when you have been lulling your baby to sleep for an hour already it can seem never ending. Making sure that your baby isn't waking because they're uncomfortable, cold etc is something that you can make sure isn't a problem. A good quality mattress that is both safe and comfortable is a necessity. Baby sleeping bags are fantastic as your baby can't kick them off - no more re-tucking them in every time they wake up cold. 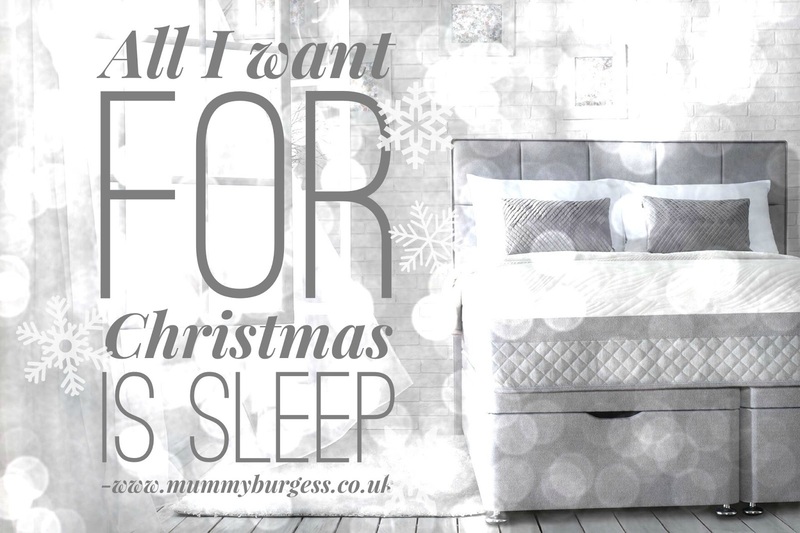 For me my sleep quest continues, on Henry's Christmas list is a new mattress as I'm convinced since he has moved from his moses basket (which had a luxury mattress that he adored) to his cot (a much firmer mattress) he has been waking so much more. How does your little one(s) sleep? Are you getting enough sleep?